On September 30, 1942 the Wall Street Journal reprinted the humorous story from The Strand in its “Pepper and Salt” humor column and acknowledged the magazine. This key citation was found by Ben Zimmer, and it was included in the important reference work The Yale Book of Quotations [BZCQ] [WJGP] [WJYQ]. The tale in The Strand was popular and it was reprinted in several periodicals. For example, on October 7, 1942 it was published in the Christian Science Monitor [CSMS]. In November 1942 the joke was printed in the Journal of Accountancy [JACT]. Prime Minister Winston Churchill’s pursuit of clarity and brevity in those embryonic state papers that British Ministers call “minutes” picked up considerably last week. “This is the kind of tedious nonsense which I will not put up with.” Just to make his intention plain, the Prime Minister underscored “up” heavily. “This is the kind of tedious nonsense with which I will not put up.” The prime minister underscored “up” heavily. In this instance the word “up” was placed at the end of the sentence attributed to Churchill. So once again any joke about avoiding the terminal placement of prepositions was undermined. QI suspects that the joke was garbled either in Britain or the United States. Los Angeles: The superstition that it is ungrammatical to end a sentence with a preposition will doubtless be with us to the bitter end, despite your good efforts to explode the myth. Have you heard the one about the commanding officer who, on learning that one of his decisions had been criticized by his junior officers, posted a notice on the bulletin board which read: “This is a type of criticism up with which I shall not put”? Latest Churchill story going the rounds has to do with a stuffy young Foreign Office secretary who had the job of “vetting” the then Prime Minister’s magnificent speeches. The young man disliked the P.M.’s habit of ending sentences with prepositions and corrected such sentences whenever he found them. 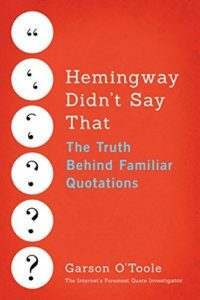 In conclusion, the anecdote presenting a comical response to grammatical advice about prepositions began as a joke. The earliest known instance of the joke appeared in The Strand magazine in May 1942. The setting of the joke was an unspecified government department, and the author was not listed. Other figures such as a military commander and Rudy Vallee have also been featured in the gag. Winston Churchill was connected to this humorous idea starting in 1944 with a message sent from Britain to North American newspapers. The comical story with Churchill evolved over a period of two years until the modern version emerged by 1946. The illustration at the top of this post shows essayist John Dryden because he is usually blamed for formulating the rule prohibiting prepositions at the end of sentences. That’s what you get for using the passive voice. Now, if he’d simply said, “I will not put up with that,” there’d be no story, would there?